I am getting ready to split my 886 for the first time. It's time for a clutch, and I figured I would do the rear main seal at the same time. It's a D360 - and the manual calls for a install tool. It's pretty pricey, but I'm assuming it's necessary? Also, what else should I be looking at or replacing while it's split? I only want to do it once. Thanks! troubleshooting an 806 that just "gave up"
I was just reading Richard B's post about the screaming 460. I'm hoping my problem is similar and not more serious. My dad has a 1962 806, 6cyl gas. He's had it about 6 or 7 years, don't have any history on it, he hardly ever uses it. It's always started and ran fine. It pretty much sat the entire summer, and on New Years Day I was going to blow some snow with it. It started fine, I went inside to let it warm up, came out about 15min later. I got in to idle it up, and it seemed like I had to give it more throttle than necessary to increase RPM. I got out and it started to bog down like it was under a load, gave a sort of a squeal and quit. I haven't been able to get it to turn over since. My first thought was a rod or main bearing. If I put it in neutral, I can pull it easily. If I pull it while it's in gear, the transmission won't disengage even if I push in the clutch. I took the inspection plate off the bell housing next to the starter, and I can barely turn it over with a pry bar. (spark plugs removed) Has anyone else experienced something similar. I drained the oil and no filings, pieces, or anything sparkly. I'm wondering what else to check before I split it. 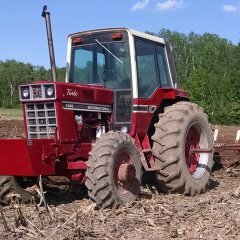 I recently changed the clutch pressure plate, pressure disk, pilot and throw-out bearing + the clutch release bearing carrier (all like stock from Stiener tractor) on my 504 utility IH tractor. I set the linkage action according to the manual specs for petal travel. The clutch actions well on the pressure fingers, but I'm not able to shift gears when I fire the tractor up?? I grind the gears if I try. I thought it must be I am not pressing deeply enough, so I adjusted the linkage to tighten on the pressure fingers and even that does not let me shift. For some reason I am not disengaging the flywheel spin enough to shift?? I'm stumped! I need to sell this tractor soon. I tried driving the tractor around and pushing the clutch in an out to burnish the clutch into working, but to no avail. I've split the tractor 3 times now to see if anything was installed incorrect, but all is in as described in the manual. Hello all, I am new to this board and case ih maxxum tractors. Due to the snow and difficult cattle feeding conditions I bought a 5240 with a loader and MFD to make things easier. So far that has not been the case. I bought it from an individual not a dealer. It has around 6000 hours. I love the tractor. It handles my ranch chores and the snowblower really well. I hauled it home and unloaded it to find 4th gear on the power shift quit working. Searched google and found this site. Pushed relays back in and problem solved. Then I replaced the water pump. I knew it had a leak just was not sure where when I bought it. Put on about ten hours feeding and blowing snow everything worked well. Then while feeding I noticed it wouldn't always move after changing ranges. So I would push in the clutch and shift out and back into the range and away it would go. Then a few shifts later it quit moving with the clutch all the way out. I drove it back to the yard with the clutch pushed in about an inch so I could plug the block heater in. Having about zero degree weather. If I let the clutch out all the way it would roll to a stop. I did some hunting and talking to local case ih service guys and checked the clutch switches with a continuity tester. They seem to work correctly. I also swapped the switches. I have 4 terminal switches. However with some experimenting I discovered by putting a jumper between the two terminals on the lower clutch pedal switch which in essence keeps the switch closed the tractors shifts and drives like normal and all the ranges and power shifts and reverser function correctly. After further discussion with the service techs we decided to replace the shuttle and transmission control relays. I bought two new 1987409c2 relays and installed them. Now the tractor won't move at all. If I reinstall the old relay in the transmission control location the tractor works if I leave my jumper wire on the clutch switch. The relay that I reinstalled in the transmission control location which is the lower right hand corner of the fuse panel has a different wiring schematic than my new relays it is a bosch pn 0332019150 see pic. The new relay schematic is shown in white. However my tractor functions with the grey bosch. This is becoming quite frustrating. I want my tractor working. Thanks in advance for your help. Hey guys. I bought a 706 with a bad clutch a while ago and have finally had time to get it split and a new clutch installed. I have everything reassembled and went to try moving it for the first time and it still would not go into gear properly you can slip into gear and when it is moving you can push the clutch in all the way and it does not stop it slows down a bit but does not stop. So I looked in the bottom cover and everything is moving as it should. So I figured it had to be the trans brake so I took the cover off with the trans brake and there is about and 1/8th inch of pad left on it is this enough? Also there was a good amount of leather in by the drain plug in the same cover from a seal I am thinking? Any ideas on this would be greatly appreciated. Hello all I recently put a d312 in my 666 tractor. I purchased a new flywheel, clutch plate, and pressure plate. Installed via directions, and fully adjusted. The problem is that I can make something slip. I don't think it is the clutch, but I don't know for sure. I can put it in road gear and slam the throttle wide open and it will slip. Or if I hold the brakes, it will slip. (Which it is, I don't know.) The torque seemed to hold with the gas motor that was in it(although I didn't run it long). Can I take a cover off and look at the mechanical torque condition? Thank you, any in sight would be appreciated.